Linguistic typology studies the various ways in which languages map form onto meaning. Thus, it identifies the different grammatical constructions that languages use to express particular functional distinctions. The present re­search is concerned with the typology of two construction types: parts of speech and dependent clauses. These constructions are studied in a sample of 50 lan­guages from all-over the world. The study aims to investigate the relationship between the functional possibilities of the parts of speech and dependent clau­ses attested in each of these languages. The parts of speech classes and dependent clauses of individual languages are categorized according to their ability to express one or more of the communi­cative functions of predication, reference, and modification. In addition, de­pendent clauses are classified according to their internal morpho-syntactic pro­perties, distinguishing between balanced dependent clauses, which are structurally similar to independent clauses, and deranked dependent clauses, which have properties in common with nominal, adjectival, or adverbial con­structions. The results of this study show that the degree of functional flexibility as dis­played by a language’s parts of speech classes constrains the degree of flexibi­lity of its deranked dependent clauses, but not its balanced dependent clauses. In particular, the deranked dependent clauses of a language hardly ever show a higher degree of functional flexibility than its parts of speech classes. 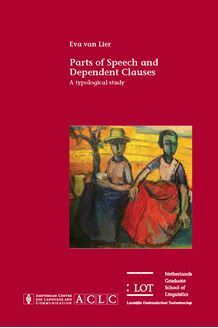 Rather, deranked dependent clauses have either an equal or a smaller range of functi­onal possibilities as compared to the parts of speech classes on which they are structurally modeled. The findings are interpreted from a functionalist perspective: They shed light on the way in which languages establish maximal functional transparency, by dividing the workload of assigning specific functions to specific structures over the lexical, morphological, and syntactic devices available in their grammati­cal systems. This study is of relevance for linguistic typologists who work in the functionalist framework and who are interested in lexical and morpho-syntactic categoriza­tion.